Young Australian team survived the 'trial by spin' against all the odds in the first Test match against Pakistan in Dubai to force the Test match into a Draw. Their openers, Aaron Finch and Usman Khawaja, were rock solid in both the innings while their captain Tim Paine survived on the fifth day to push the Test match to a Draw. As a result, Australia had managed to draw the first Test match with 2 wickets in hand. Here are some of the statistical highlights from the first Test match between Pakistan and Australia in Dubai. Let us take a look at some of the statistical highlights from the match. 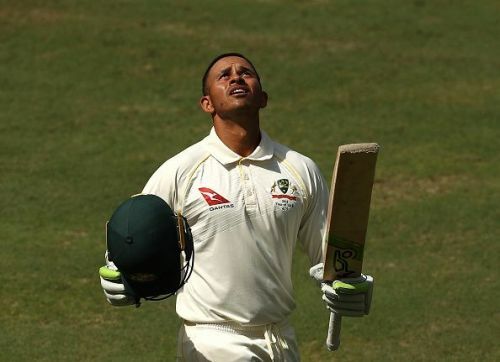 85 & 141 – Scores for Usman Khawaja in both the innings of the first Test match against Pakistan in Dubai. Before this Test match, Khawaja had a best score of 26 in the 9 Test innings he played in Asia. Khawaja, under pressure, improved his batting figures in Asia with two back-to-back half centuries. 5 – Number of Australian players to have registered a century in the fourth innings of a Test match in Asia. Rob Simpson (115 in 1964), Mark Taylor (102* in 1998), Ricky Ponting (118* in 2006), David Warner (112 in 2017) and Usman Khawaja (141 in this Test match) are the five players in this list. Usman Khawaja is the latest entrant in this list. Also, Khawaja is the first Australian player to register a fourth innings century in UAE. 139.5 – Number of overs batted by Australia in the fourth innings of this Test match to enforce a Draw. These are the third most number of overs batted by any team in the fourth innings of a Test match in Asia in a Draw match. Bangladesh (142.0 overs against Zimbabwe in 2005) and England (140.0 overs against Sri Lanka in 2003) are the first and second in this list respectively. 5 – Number of consecutive Test matches in which Yasir Shah picked up a five-wicket-haul-in-an-innings before this Dubai Test match. And this record of Yasir has come to an end! Yasir Shah registered 4 for 114 in the second innings of this Test match while he was wicketless in the first innings. 22 – Number of consecutive Test matches Pakistan played without a draw before the Dubai Test match. Pakistan’s last Draw had come against England in Abu Dhabi in 2015. Zimbabwe (26 Tests) and Australia (23 Tests) are the only teams to have played more consecutive Test matches without a Draw than Pakistan. 6/36 – Bowing figures of Bilal Asif in the Dubai Test match who made his Test debut for Pakistan. These are the third-best bowling figures for a Pakistan bowler on debut while he is the 11th player from Pakistan to register a five-wicket haul on Test debut. Follow Sportskeeda for all latest cricket news, scores, playing XI, match predictions, fantasy tips & stats.